Sean Phelan with DCI Hall of Fame member Gene Monterastelli. 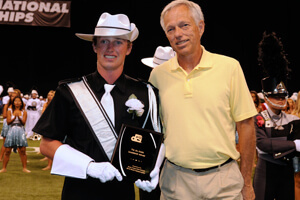 This summer, several recognitions and scholarships were presented to corps members during the 2012 DCI World Championships at Lucas Oil Stadium in Indianapolis. Named for the former director of the Troopers and founding member of Drum Corps International who passed away in 1994, the Jim Jones Leadership award is given each year to one World and one Open Class drum major who exhibits unparalleled leadership qualities. Madison Scouts drum major Sean Phelan and Oregon Crusaders drum major Happiness Yi were selected by a committee of DCI Hall of Fame members to be the 2012 recipients. "It's certainly gratifying and humbling," said Phelan, who is a music education and mathematics major at the University of Wisconsin. In his sixth and final year with the corps, he helped lead them to a ninth place finish at the 2012 World Championships – the corps' highest finish since 2006. Happiness Yi receives the Jim Jones Leadership Award. "All the drum majors put in a lot of work," he said. "It's a selfless job to begin with. It's not about the recognition." Phelan said as a leader, he likes to understand how things are done and find better ways to do them. He likes working with people so that everyone understands what they're trying to do, and not just doing what someone tells them. 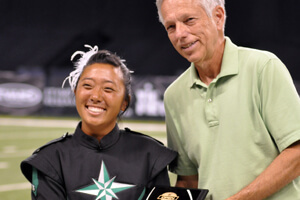 Yi said she was surprised when she found out she won the Jim Jones award after DCI Hall of Fame Gene Monterastelli walked up to her on the field during the Championships and told her. Before she got to that point, she had to be recommended by her corps director, complete an interview and undergo a conducting evaluation during performance. "Honestly, I didn't really notice," she said about being evaluated. "Because when it's show time, it's me and the corps and nothing else matters." Music City's Kevin Hoenie with Harold "Pops" Ott. 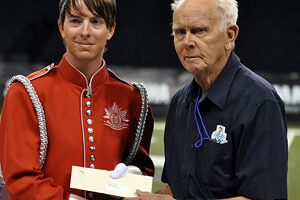 Other honors given out during the 2012 World Championships was the first George and Patsy Bonfiglio Scholarship, by the 27th Lancers Foundation, to Zack Crissman from the Blue Stars. The Dutch in DCI Foundation, founded in 2006 to support talented young Dutch performers, awarded $1,000 scholarships to Erwin de Jong from the Colts, David Roes from the Blue Stars, Demy van der Jagt from Boston Crusaders and Jan Bakker from Carolina Crown. The 2012 Jim Ott Scholarship, given each year by the California nonprofit organization Sponsors of Musical Enrichment to a drum corps member pursuing higher education in the music field and who demonstrates leadership qualities, was awarded to Kevin Hoenie from Music City. The Friends of DCI Scholarships were awarded to Christopher Monetmayor from the Blue Devils and Elizabeth Miller from the Blue Stars. Also administered by DCI's Friends of DCI program, the Richardson's Scholarship, given to members who wish to apply their skills to a degree in music education, was awarded to Cody Edgerton from Madison Scouts and Zach Jansheski from Carolina Crown.